When we brought our little guy home from the NICU he didn't want a pacifier and he didn't want to be rocked. But...he could not sleep without being swaddled. At first this wasn't an issue because he was tiny and an infant. I would just wrap his little arms and legs and tuck him into bed. Easy peasy. The longer he was swaddled, the more I would wake up in the morning with his arm busted out or the entire swaddler switched around. He was getting stronger. I had to find a different solution because nothing was working and he kept waking himself up. Here is my review on the two that we used. The first when we first brought him home and the second for when he got bigger. Both were wonderful, easy to use and budget friendly! Summer Infant swaddler are wonderful because they are light weight material. For us, Jack sweat at night when he slept and so I worried about him overheating in the summer. The material is soft, comes in a variety of colors and styles (boys and girls) and it's very easy to swaddle. Plus it's breathable and you can throw it right in the washing machine. The foot pocket at the bottom pops down for an easy diaper change...always helpful in the middle of the night! The velcro has grips and an entire side area to put the grips so you can make it pretty tight. There is a slit in the bottom area that I never knew what it was for. But I just realized that you can actually put your child in their car seat or a stroller and put the clip through the swaddler and then swaddle the baby. Never tried it, but a cool feature! One downside to this swaddler is that Jack quickly outgrew these and his hands were constantly confined to his sides like a straight jacket. This is a magical invention! The Woombie is like a big stretchy sock! 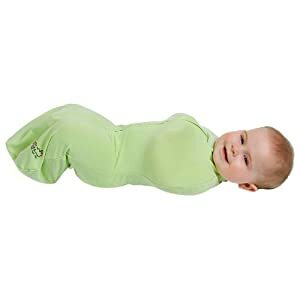 It's made of a light breathable material as well that stretches so that your infant can still move their hands and feet (unlike other swaddles), but it keeps them confined so they aren't hitting themselves in the night and waking up. The best thing about it is that it's a one zip and that's it! We use to call Jack our little caterpillar because that's how he looked in it. You can buy sizes based on your child's weight which was nice as well since Jack is tall and quickly outgrew the Summer Infant. Our little guy loved being put in his and always knew it was bedtime. It kept him warm, but not hot. Confined, but not tied down. It also made me feel safer knowing that he knew how to roll to his stomach and so he could push himself up like a pushup because the material is so stretchy. **I don't recommend swaddling them much longer after they know how to roll over because it's dangerous.